If you are like us, you are always looking for creative things to make with all of that leftover smoked meat you have in the refrigerator. One of our favorite leftover dishes for smoked chicken is to tear it into small pieces and toss it into a soup. Simply chop up some vegetables, mix it with the pieces of bird, add some chicken stock and maybe some drippings from your smoking session and let it sit. Obviously, like all soups, the longer you let it simmer the more flavorful it will become. This is the grown up version of the chicken noodle soup recipe your mom made you when you were sick as a kid that will have you coming back for seconds. 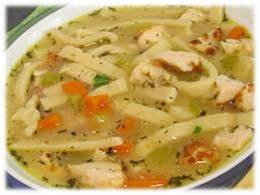 This recipe starts off with already smoked chicken breasts that you cut or shred for your chicken noodle soup, making it a great meal for leftover chicken. If you don't have leftovers, you can see the smoking your chicken breast recipe to learn how to make it. Chop your carrots, celery, and diced onion. Put a stock pot on your range over medium high heat with olive oil or butter and once the butter is melted or the oil is warmed, add your carrots, celery, and onion and cook for 3 minutes. Add the remaining ingredients to the pot: diced/shredded smoked chicken, garlic, parsley, black pepper, salt, thyme, bay leaves, water with bullion or chicken broth and your egg noodles. Once the soup mix comes to a boil, turn your range back from medium high to low heat and let the chicken noodle soup mix simmer for 30 minutes to an hour before serving.